Large pores are the bane of my skin existence. I can deal with oily skin and maybe even a break out or two, but large pores are permanent. Though I take extremely good care of my skin, my pores are the size they are and much like height or natural hair color, there is little I can do to change it. Now that being said, I am constantly on the hunt for products to help minimize the appearance and deal with any dirt, debris and congestion that comes from living in a big city, wearing makeup everyday and regular daily activities. I've been testing out a ton of different products over the past few months and these 4 are the ones that stood out the most to me and gave me the best results. A clean pore is a happy pore, right? Right. 1. Rodial Super Acids X-Treme Pore Shrink Cleansing Pads - I mentioned in my last Youtube video that although my First Aid Beauty Blemish Patrol Pads are my holy grail, I was testing out other facial pads that help to target blemishes and large pores. I gave myself a 2.5 week break from using any facial pads before using these to see if I really would see a difference. And I am happy to report that I did! These Rodial pads are designed to help sweep away dirt and oil and minimize the appearance of large pores.....and I did not break out once while using these - which tells me they work! I didn't find that my pores looked any smaller but I did notice the congestion I had from not using any facial pads for a few weeks went away immediately after a week on these Rodial pads. I use after I cleanse and before I apply my serum and moisturizer. 2. Dr. Dennis Gross Clinical Concentrate Purifying Booster - After having excellent results using this booster from Dr. Dennis Gross, I was excited to rotate this into my routine once the other ran out. Though I love a good radiance product, I have so many peels, moisturizers and masks that help with that so I felt this booster would be one that I may benefit from even more. And I was right. I added this into my morning routine, using it on its own first and then eventually mixing it with my trusty Clarins Double Serum, which I have been using for quite a few months now. During the first few days of using the booster, my skin was noticeably less oily and there was a slight appearance of smaller pores. I even added this into my evening routine as a spot treatment under my trusty Clinique acne treatment and found that any small blemish I had cleared up quickly. I love the idea of a booster and the ease of adding it to any routine rather than having to substitute it for anything is what appeals to me the most. 3. Dr. Jart+ Pore Minimalist Mask - I love a good detoxifying mask and I immediately fell in love with it after just one use. It has a cooling sensation and gave me the best overall results out of all 4 products. My skin looked noticeably clearer and gave me the best appearance of smaller pores after using. After leaving on for 7-10 minutes, I remove the sheet mask and massage in the remaining product which leaves my face feeling incredibly fresh and clean. Skincare is as much about the experience of using the product as it is the results. This mask was so pleasurable to use and left my skin feeling so great which automatically makes it memorable and definitely a repurchase product. 4. 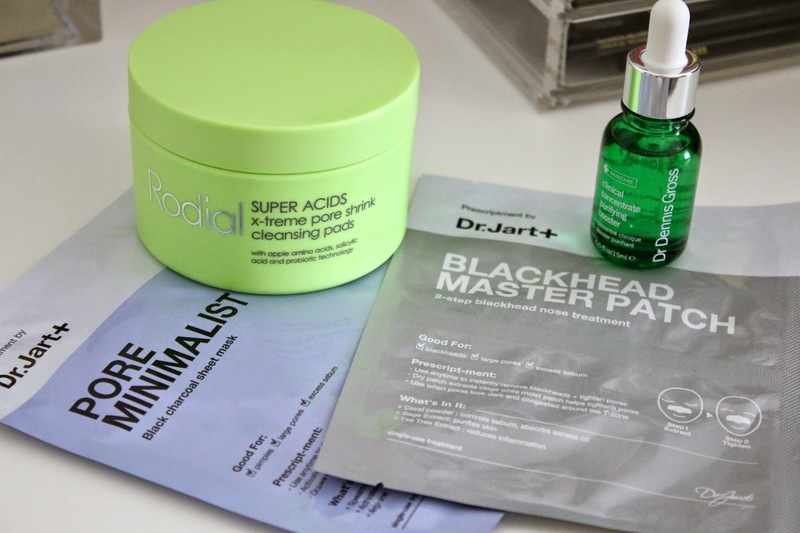 Dr. Jart+ Blackhead Master Patch - Just the name alone let me know I was in for some serious pore cleansing. Much like the ever-famous Biore pore cleansing strips, these are applied to the nose area and are designed to pull out dirt and debris. I remember the Biore strips to be quite mild, whereas this patch was extremely heavy duty. It adhered to my nose immediately and while removing it was a bit tedious because it went on so effectively, it did a phenomenal job at decongesting my pores. And as gross as it sounds (we all do it, so just admit it), when I looked down at the patch after I was amazed to see how much dirt it had removed. The best thing about this patch is the treatment doesn't just stop with the initial removal which can leave the skin dry and irritated. It has a wet patch you apply after and leave on for 10 minutes. This helps soothe the skin, calm down any irritation and keep the pores purified. That final step is what takes this blackhead patch to the next level and makes it more effective. What are some of your favorite pore purifying treatments?